San Francisco Chronicle: "This was a virtuoso display of technical bravura and emotional eloquence, all wrapped into one beautifully integrated package." San Jose Mercury News: "His performance Wednesday was a jaw-dropper." Examiner.com: "Béla Bartók’s second violin concerto, was anything but conventional; and the interpretation of the solo part by Christian Tetzlaff could not have been more up to the task." San Francisco Classical Voice: "From moments of tender lyricism and spooky sound sculpturing to the far-more-common strident militancies, orchestral outbursts, and thrilling virtuoso expostulations, the Tetzlaff-Tilson-Thomas axis held the Davies Symphony Hall patrons in thrall." Photo via the artist's Facebook page. 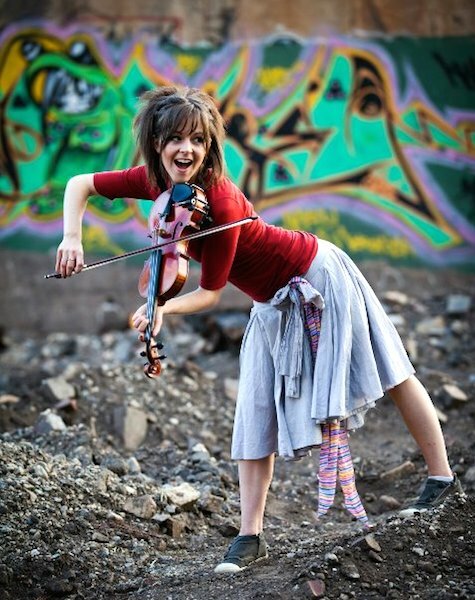 Lindsey Stirling performed in concert in Anaheim, Calif.
Orange County Register: "Not only did Stirling bow away with flawless precision, whether on a classical model or a modern electric version, she also moved like Jagger and sometimes joined two dancers in choreographed routines while fluidly continuing to play." Independent Online Tonight: "Her technical abilities are obvious, and in her youthful way she captured the joyous spirit of this lovely work." Chicago Classical Review: "The Korean-born violinist was most impressive in the lyrical moments, playing with a rich, singing line and tonal sweetness ideal for Glazunov’s melodies." NUVO: "With an occasional slip here, a squeak there, and an off-pitch at another place, Beilman nonetheless captured the essence of the work's solo parts with a well controlled tone and the chops to manage the difficult figurations." Minneapolis Star-Tribune: "The emotional temperature was cooler and less expansive, leaning more on Mendelssohn’s classical roots than his yearnings toward Romanticism." The Pioneer Press: "Keefe's take on the concerto was as sweet and strong as a powerful liqueur, aggressive in the early going, fiery in the finale, but at its best in a velvet-draped middle movement, her clear, sonorous lines the conduit for a palpable yearning." Washington Post: "When (the dancers) reappeared quietly on the stage below, they stood rapt, as we all were, by the violinist’s vigor." Los Angeles Times: "The violinist's was a physical performance, exceptional technically, but none of the added emphasis added depth." Violinist.com: "As Bell entered over the hushed static of the orchestra -- his 1713 Gibson Strad so clear, so pure -- the talking ceased, audience fully arrested by the music. How does Joshua Bell do that?" The New York Times: "Mr. Shaham played the technically daunting violin part of this two-movement concerto with command, clarity and melting sound." New York Classical Review: "Shaham (dove) into the lines of his solo part with a warm tone and full vibrato that one might expect in a nineteenth-century concerto." ConcertNet: "Listening to Mr. Shaham, one knows that feeling needs no age or era." We'd love to hear about any recent concerts and recitals you've attended, too. Or just tell us in the comments what you think about these reviews! Is anyone else wondering about Lindsey Stirling's "flawless precision" while Ben Beilman gets taken to task for a few bobbled notes in Mozart? Is pop music such a completely different animal from classical, that the critics of each would have completely different standards and levels of knowledge about music? I thought the same thing when I read that! Strange...(sadly?) most of my friends have heard of her, and none of Hadelich, Tetzlaff, Shaham, Hahn, etc. I was lucky to be at Mr. Tetzlaff's spectacular Saturday performance of the Bartok. What wasn't mentioned in the reviews is that on his very last note of the final movement (I suppose, since it was Saturday, it was his final note/bow stroke this year with the SF Symphony after over a week of performances at Davies), he had so much energy that his bow went flying through the air and might have hit a violist behind him (unsure). He stumbled back surprised and the audience (and I) gasped...and then, once he and all of Davies regained their senses, the standing O came a-flying. I've never seen anything like that, and may never again. What an evening! Wow, Timothy, that sounds like a performance of a lifetime! Every review was a rave for Tetzlaff's Bartok; and how great to have such a triumph with a piece that is hardly a guaranteed "crowd pleaser"! I have a recording of Joshua Bell playing the Sibelius with the LA Phil, and I love it. In the first few seconds, the violin sets the mood for most of the whole piece. The first note is played almost inaudibly, and gets louder very gradually. The vibrato is minimal or nonexistent at first, and it, too, increases as the violinist continues playing. The overall effect is a slender, taut, almost bare bones mood at the beginning of the piece. It sounds to me like Finland as I've seen pictures of it: lonely, stark, and then the bright shimmering of the Northern Lights. I have listened to the first few seconds of this concerto on recordings by several violinists. They all use similar techniques and get similar results starting with the first few seconds of the piece, but nobody else does it as well as Bell, in my opinion. I wrote a blog about the concerto, and it was published on v.com on 10/23/11. Maybe she really did play with flawless precision. Presumably, she was playing her own compositions. Maybe all of the performers bobbled a few notes, but we won't know, because getting a concert through a critic is a pretty strong filter. In any case, I never hear much in any of the reviews, but my ears aren't all that precise.